Who should not take Dihydroergotamine MESYLATE Aerosol, Spray With Pump? This medication is used to treat migraine headache attacks. It helps relieve headache pain and other symptoms such as sensitivity to light or sound. Prompt treatment allows you to get back to your normal routine sooner and may decrease your need for other pain medications. This medication is not used to prevent migraines from occurring. Dihydroergotamine belongs to a class of drugs known as ergot alkaloids. It may work by narrowing the blood vessels in the brain. It may also block other pain pathways in the brain. This medication comes in individual nasal spray vials. Each vial contains enough medication to treat a single migraine attack. Do not use more than 4 sprays for a single attack. Before using each nasal spray vial, prime the pump by spraying 4 times into the air, away from the face. The US and Canadian manufacturers recommend: at the first sign of a migraine, spray this medication into the nostrils. Do not inject this medication. Use 1 spray into each nostril. Do not tilt your head back, sniff through your nose, or blow your nose while spraying or immediately after. Use another spray into each nostril 15 minutes after the first sprays, or use as directed by your doctor. After using the medication, you should lie down and relax in a quiet, darkened room. Therefore, the maximum number of sprays you can use for a single attack is 4 sprays (two in each nostril). You should feel some relief within 30 minutes of using this medication. The Canadian manufacturer further recommends to not use more than 8 sprays in 24 hours or 24 sprays in 1 week. Your condition will not improve any faster, and your risk of side effects will increase. The dosage is based on your medical condition and response to treatment. Do not increase your dose or use this drug more often or for longer than prescribed. This medication works best if it is used as the first signs of the headache occur. If you wait until the headache has worsened, the medication may not work as well. Use only as needed to treat migraine attacks when they occur. It is not meant for long-term daily use. If you have never used this medication before and you have risk factors for heart disease (see Precautions), you may need to be monitored for rare but serious side effects (such as chest pain) when you take the first dose. Your doctor may ask you to take the first dose in the office. If you also take "triptan" or other ergot medications (such as sumatriptan, methysergide), wait 24 hours before and after taking dihydroergotamine. Consult your doctor or pharmacist for more details and for advice on how to time your doses of these medications. 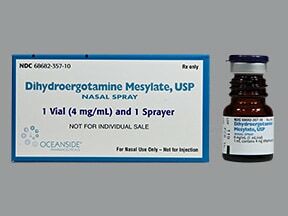 What conditions does Dihydroergotamine MESYLATE Aerosol, Spray With Pump treat? Sore nose/throat, stuffy/runny nose, changes in taste, dizziness, or nausea may occur. If any of these effects persist or worsen, tell your doctor or pharmacist promptly. This medication may rarely cause a very serious lack of blood flow. Stop using dihydroergotamine and tell your doctor right away if any of these rare but very serious side effects occur: slow/fast heartbeat, weakness in the legs, muscle pain in the arms/legs, tingling/numbness, feeling of coldness in the hands/feet, blue fingers/toes, severe stomach/abdominal pain. Seek immediate medical attention if any of these rare but very serious side effects occur: jaw/left arm pain, chest pain/pressure, sudden tiredness, weakness on one side of the body, slurred speech, vision changes, mental/mood changes (such as confusion). List Dihydroergotamine MESYLATE Aerosol, Spray With Pump side effects by likelihood and severity. Before using dihydroergotamine, tell your doctor or pharmacist if you are allergic to it; or to other ergot alkaloids (such as ergotamine, methysergide, bromocriptine); or if you have any other allergies. This product may contain inactive ingredients, which can cause allergic reactions or other problems. Talk to your pharmacist for more details. Before using this medication, tell your doctor or pharmacist your medical history, especially: heart disease (such as chest pain/angina, heart attack), stroke, high blood pressure, blood circulation disease (such as peripheral arterial disease, Raynaud's syndrome), a certain severe blood infection (sepsis), bowel disease (such as ischemic bowel syndrome), kidney disease, liver disease, headaches with unusual symptoms or certain types of headache (hemiplegic/basilar), recent blood vessel surgery, nasal problems (such as chronic congestion, nasal allergies). Tell your doctor if you have the following risk factors for heart disease: high blood pressure, high blood cholesterol, obesity, diabetes, smoking/tobacco use, family history of heart disease. If you are at high risk for heart disease, your doctor may want to check your heart before prescribing dihydroergotamine and give your first dose in the office. This medication passes into breast milk and may harm a nursing infant. Do not breast-feed while using this drug. What should I know regarding pregnancy, nursing and administering Dihydroergotamine MESYLATE Aerosol, Spray With Pump to children or the elderly? Some products that may interact with this drug include: bronchodilators/decongestants/stimulants (such as epinephrine, pseudoephedrine, methylphenidate, amphetamine). Does Dihydroergotamine MESYLATE Aerosol, Spray With Pump interact with other medications? If someone has overdosed and has serious symptoms such as passing out or trouble breathing, call 911. Otherwise, call a poison control center right away. US residents can call their local poison control center at 1-800-222-1222. Canada residents can call a provincial poison control center. Symptoms of overdose may include: severe/sudden numbness, blue or purple hands/feet, slow/difficult breathing, confusion, seizures. Laboratory and/or medical tests (such as EKG) may need to be performed to monitor your progress or check for side effects. Consult your doctor for more details. Certain foods/beverages or food additives (such as red wine, cheese, chocolate, monosodium glutamate, alcohol) as well as some lifestyle patterns (such as irregular eating/sleeping habits, stress) may bring about a migraine headache. Avoiding these "triggers" may help decrease the frequency of migraine headaches. Consult your doctor for more details. Take this medication only as needed when a migraine occurs, as directed by your doctor. This medication is not taken on a regular schedule. Store at room temperature at 59-77 degrees F (15-25 degrees C) away from heat, light, and moisture. Do not freeze or refrigerate. Do not store in the bathroom. Discard opened nasal spray vials 8 hours after opening. Keep all medicines away from children and pets. Are you taking Dihydroergotamine MESYLATE Aerosol, Spray With Pump? Are you considering switching to Dihydroergotamine MESYLATE Aerosol, Spray With Pump? How long have you been taking Dihydroergotamine MESYLATE Aerosol, Spray With Pump?